Kcatt - ohio They work "I have been using this product for years now. I have never had any problems rather than them ripping at the seam when installing them. However, once i get them all situated and am able to ride with these on, I haven't had any problems. One thing that you have to do with these is clean them very thoroughly. If that is done then there shouldn't be any problems." 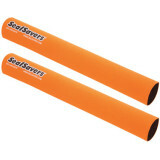 Chuck - Oakley, CA 94561, USA I have used seal savers on every bike I have ownd "Great product. Same great quality through the years"